"Simple healthy stir-fry recipe. Great vegetarian dish because it has protein. It is low fat and it has healthy spices too." Bring water and rice to a boil in a saucepan. Reduce heat to medium-low, cover, and simmer until the rice is tender and the liquid has been absorbed, 20 to 25 minutes. Heat sesame oil in a large skillet over medium heat; cook and stir collard greens, garlic, and red pepper flakes in the hot oil until collard greens are wilted and tender, about 10 minutes. 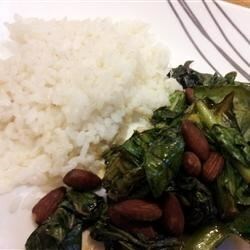 Mix almonds, lemon juice, soy sauce, and ginger into collard green mixture; simmer until liquid evaporates, about 5 minutes. Serve with rice on the side. If you want to change the dish around, feel free to use cashews or peanuts in lieu of or addition to the almonds. Butter or olive oil as well work fine for the oil.